My love for children’s books is strong, and it’s no secret. My love of sharks is strong too… and also not a secret. I have been steadily growing sections of my classroom library, and while I have plenty of informative, real life “picture” fact books about sharks, I wanted to introduce more shark books to my students. These books about sharks for kids are informative, somewhat intense, but so important. 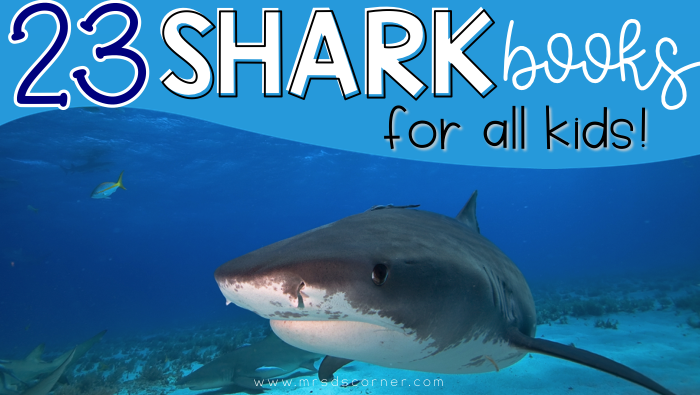 Sharks are the biggest part of the ocean ecosystem, and sharks need our help. Sharks aren’t the “bad guys” you see portrayed in the movie Jaws or the highly comedic Sharknado, and I am on a mission to change how my students view sharks… starting with these books. Shawn Loves Sharks is a book about a boy who loves sharks more than anything else in the world. But when Predator Day comes around at school, he isn’t assigned a shark. Instead, one of his classmates is assigned the shark. Read along this fun book to find out how this fun story plays out. Swimming with Sharks: The Daring Discoveries of Eugenie Clark is a fascinating book that brings new light to the viciously feared blood-thirsty shark. If Sharks Disappeared is a thought provoking book on over-fishing and how many shark species are in danger of extinction. Through this clever book, readers will explore how the disappearance would affect other animals across the whole planet. Shark Detective! Is a fun and quirky story about a Shark who lived a lonely life in the big city. But at night, he dreamed of becoming a detective! Read along this fun adventure as Shark helps solve a case of a missing kitty. What If the Shark Wears Tennis Shoes? is a book about a boys active imagination that allows a shark to get all the way upstairs! Will it eat him? You’ll have to read this fun and imagination provoking book to find out! Shark Lady: The True Story of How Eugenie Clark Became the Ocean’s Most Fearless Scientist is an inspiring story about a woman who dared to dive, defy, discover, and inspire! Shark Dog! is a funny and sweet story of Shark Dog: half shark, half dog, and a one-of-a-kind pet. This book is perfect for adventure and giggles. The (Not) Sleepy Shark is a story a bout a shark who’s tired but not ready to sleep. This fun bedtime book explores the way other sea animals get ready for bed. Chompy the Shark: Bedtime Stories for Kids follows along Chompy the shark and his friends. This book is a wonderful storybook for early readers, reading aloud, and of course as a bedtime story. Neighborhood Sharks: Hunting with the Great Whites of California’s Farallon Islands is an intimate portrait of the life and habitat of the great white shark. This wonderfully written book will help kids learn about the life cycle, biology, and habitat of the great white shark. Hark! A Shark! : All About Sharks is one that all kids will love as Cat introduces beginning readers to all kinds of sharks through rhymes and quirky story telling. Shark Nate-O is a book about a boy named Nate who loves sharks and reads lots of books about sharks. He even loves to pretend he IS a shark – but there is one problem…Nate doesn’t know how to swim! Read along this fun story as we find out if Nate will learn how to swim! The Hungry Shark follows Amelia around as she’s looking for her lunch but all the sea creatures find a clever way to protect themselves. The Three Little Fish And The Big Bad Shark is a hilarious retelling of The Three Little Pigs that kids will have such a fun time with! It’s funny and filled with eye catching illustrations! How to Survive as a Shark provides a fun and unique take on fish science that will entertain (and teach) readers. Clark the Shark is a wonderful read aloud picture book filled with rhyme and rhythm that all kids will love! Sharkabet is a fun book reading through the alphabet for children of all ages, while learning about sharks! Shark vs. Train is a hilarious and wacky picture book where Shark and train egg each other on for one competition after another. Surprising Sharks: Read and Wonder is a compelling story filled with colorful illustrations and captivating facts about sharks. The Shark in the Dark is a book about a lurking shark in the deep, dark sea, searching for a snack. Filled with lively rhyming and beautiful illustrations, this one is a tale that will be a hit with all the kids. Clark the Toothless Shark is a tale about a shark who longs to fight ferociously with the other sharks – but he has no teeth! Nugget and Fang: Friends Forever―or Snack Time? is a hilarious story about an undersea unlikely friendship. Read along and enjoy the beautiful illustrations! Five Little Sharks Swimming in the Sea takes a popular rhyme and adds a clever undersea twist. This is sure to be a favorite of kids of all ages! Are there any really good shark books that I’m missing? Let me know by leaving a comment below! Thank you so much for featuring Shark Nate-O and what a great collection you put together! Two others I love are Land Shark by Beth Ferry and I Love Sharks Too By Leanne Shirtliffe.